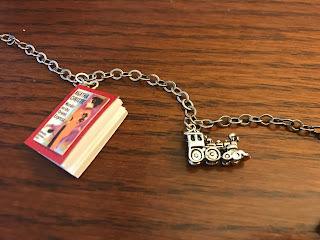 We're a little excited about the Murder on the Orient Express movie coming out tomorrow so we decided to help you set up your own party complete with invitation, food, jewelry to wear to the party and gift bags. You'll just have to wait for tomorrow's drinks with reads post to check out our suggested drink. First on the list is the invitation. Ours was created by Lorraine Masonheimer and you can find directions here. Next up is food. Here's how to make the delightful tea sandwiches that you see above and here's how to make our Murder on the Orient Express Train Cake seen below. 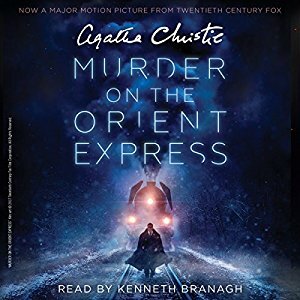 The best background you could have for your Murder on the Orient Express party is the audio book narrated by Kenneth Branagh. The fabulous vintage tea towel in the background was loaned to us by Bottle Shop 33 in Denver. We also have special Murder on the Orient Express Gift bags. And special handmade necklaces to salute the story. Hope you enjoy our Murder on the Orient Express Party as much as we did. Big thanks to Kerry Hammond, Sharon Long and Lorraine Masonheimer for helping to put on the party.